Shopping at the farmers market in the middle of summer is hard. Really hard. It’s not that iI have too much summer fun planned. Or that it’s hot. Well okay, it is hot, but that’s not related to the difficulties I’m facing at the market each week. No, the source of the problem is simply this: there are too many choices! Every week each farmer’s stand is overflowing with summer favorites like corn and tomatoes (the very inspiration for this post in fact) as well as variety upon variety of squash, melons, peaches, figs, and more. If I bought everything I wanted each week we’d have to eat five meals a day. I realize of course this is a quality problem. It’s in fact right at the root (hah!) of the reason we shop at farmers markets: to take advantage of seasonal finds and learn to cook with what our seasons and talented farmers gift us with. This lovely summer salad combines summer flavors in their raw glory so you can enjoy, if not revel, in them. 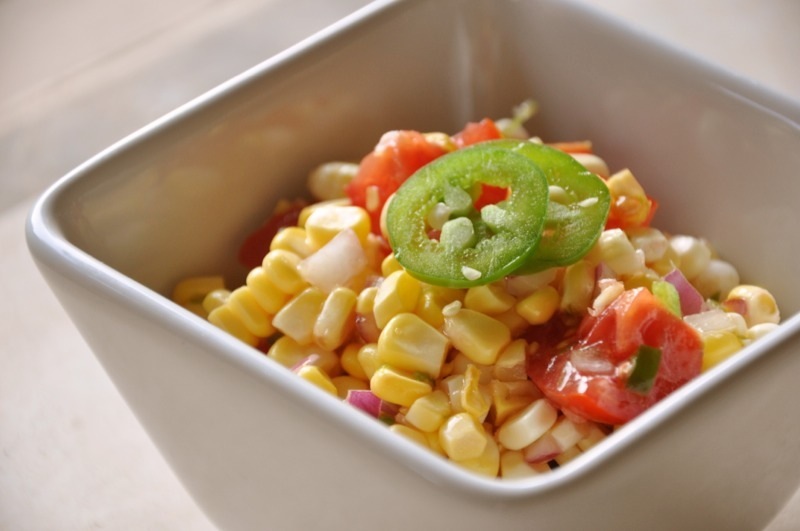 Jalapeno adds a little kick and lime some tartness to balance out the sweetness of the corn and tomato. This no-cook salad lets the flavor of all of the peak-of-summer vegetables shine. A bit of jalapeno spices things up. It’s perfect for a picnic, potluck, or al fresco dinner on a warm evening. Add the corn kernels, red onion, jalapeño, and lime zest to a medium bowl. Mix gently to combine. Whisk the lime juice and olive oil together in a small bowl. Pour over the corn mixture and stir until all of the veggiesare coated with the dressing. Add the tomatoes and salt and stir gently to combine; the goal is to keep the tomatoes from falling apart while you mix so don’t go crazy. Before serving, give the salad a couple of gentle stirs, taste and add a bit more salt if needed. Serve it up. This salad works because it makes the most of the freshest summer vegetables. While you could technically use frozen thawed corn in this recipe, I really suggest you don’t. The thawed corn will be mushy instead of crunchy so it won’t contrast with the soft tomatoes. The whole salad will just be soft which is no fun. I like to use cherry tomatoes cut in quarters or Campari tomatoes cut onto 8ths because they hold their shape well. You can strip the corn from the cob, chop the onion, and zest and juice the lemon 6-8 hours before you plan to mix the salad. Don’t cut the tomato or mix the salad until about 30 minutes before you are ready to serve it. The tomatoes will get uber-juicy and the salad will be more soupy than crunchy. You can easily multiply this recipe times any number to serve a larger crowd. Your bowls size and the amount of corn you’re willing to husk are the biggest limiters to how much you make. You can easily modify this salad to include any other in season vegetables you can lay hands on. A chopped cucumber or summer squash would be a nice addition. If you are particularly sensitive to spicy food, reduce the amount of jalapeño to 1/2 or so of the jalapeño. Conversely,you can add more jalapeño or leave some of the ribs and seeds in to amp up the heat if you are so inclined.